Most of the Waddington aircrews were off on leave today, but the war was still going on and someone had to fight it. The bright moonlight – it was three days off the full moon – precluded any long penetrations to Germany’s heavily defended cities by the massed Main Force, but made for ideal conditions for precision raids. In the south of France, aircraft factories and repair sheds at Toulouse were engaged on work on Heinkel HE111 and Junkers Ju88 aircraft, and Bomber Command wanted that work disrupted. 148 aircraft, all from 5 Group, were sent to four adjacent sites in the city and 21 of them were from Waddington, taking off around 20.30. With its usual crew on leave, LM475 B for Baker was flown on this operation by Pilot Officer Bill Mackay and crew. The bombers left the English coast at Selsey Bill as usual, flying south via Cabourg and Marmande before turning south-east towards the target. Only two fighters are mentioned in the Night Raid Report as being seen on the way to Toulouse. The German controllers were apparently expecting a raid on southern Germany and held their fighters for that possibility. While some predicted heavy flak and a lot of ‘hosepiped’ light flak was encountered in the target area, it had little effect on what transpired next. Conditions, on arrival, were just about perfect for this type of bombing. The target was lit by bright moonlight and there was no cloud and “perfect” visibility. The operation was led by 467 Squadron Commanding Officer Wing Commander Sam Balmer, and though his first marker failed to ignite he dropped a second one on a hangar in the north east corner of the aiming point. Following aircraft just needed to aim at that marker. And they did. If anything the raid was too concentrated: at least two crews required evasive action when on their bombing runs, not from fighters or flak but from other Lancasters. A few aircraft carried the ‘normal’ load of ‘cookie’ and incendiaries but most aircraft dropped loads of 1,000lb and 500lb bombs, all fused with a six-hour delay. The effect was that the view of the target remained unobstructed by smoke. Consequently crews could not report immediately on results of the raid, but the general feeling appears to have been that it would prove to be a successful one. 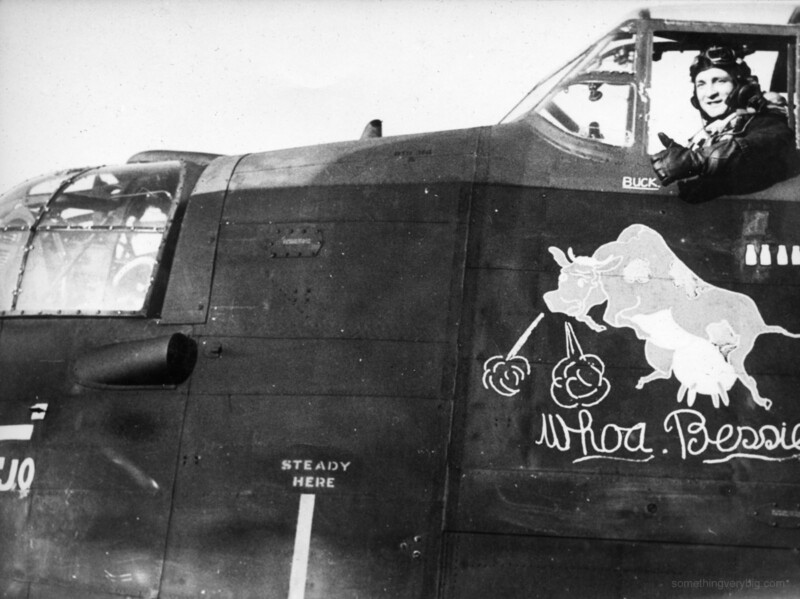 The only loss was a single Lancaster which was seen to blow up over the target; probably a victim of flak. Special mention was made in the 463 Squadron Operational Record Book of Flying Officer Bruce Buckham, whose Lancaster suffered an engine failure near Reading on the outward journey. His crew pressed on and bombed the target, albeit from a lower altitude than most so that they could maintain a reasonable cruising airspeed, and returned safely, landing at Silverstone at 04.16. In other operations, 24 Stirlings laid mines in the Bay if Biscay and 37 Stirlings, Hudsons and Lysanders flew special operations over the Continent, all without loss. And, in a move that was widely believed to be a sign of the coming invasion, all leave for ground personnel at Waddington was cancelled with effect from today. “It must be coming soon”, wrote Flying Officer McDonald in the Operational Record Book.